Jobs in transport and logistics boom, but fewer women are joining the industry. 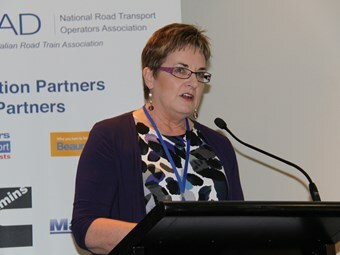 WISC chair Nola Bransgrove says transport and logistics companies will benefit from employing women. The number of women working in transport and logistics is declining, prompting calls for the industry to do more to boost female participation rates. A new report from the group Women in Supply Chain (WISC) reveals significant barriers are limiting the ability of women to enter the industry and get ahead. It found that women’s participation rate fell from 24 per cent to 22.9 per cent between 2010 and 2014, despite jobs in transport and logistics growing by 58 per cent over the same period. It says the male-dominated transport and logistics sector designs jobs with men in mind and does not promote or encourage women to apply. "Research shows that the industry continues to offer few opportunities for women to enter and participation rates continue to decline in senior management roles," the report says. WISC wants the industry to do more to reduce gender pay gaps, increase quotas for women on boards and in senior management, introduce mentoring programs, review recruiting guidelines and implement flexible working arrangements. "While acknowledging that quotas cause some problems, the time has come to institute them. It isn’t acceptable that gender is a barrier to advancement," the report says. "It has been proven that women are often overlooked when it comes to promotions and other forms of recognition, in favour of their male colleagues." It adds that between November 2013 and May this year, the gender pay gap for women in transport, postal and warehousing was 16.1 per cent lower than men working in the same industries. WISC says it believes the gender pay gap can close as more people recognise the important work women do and the role they play in transport and logistics. "More and more of Australia’s transport and logistics companies would reap the benefits of employing women and using their skills, experience and leadership," WISC chair and National Transport Commission (NTC) commissioner Nola Bransgrove says. The report says employing women will help companies innovate and develop new ideas and market insights. "A gender diverse workforce promotes collaboration, tolerance and understanding and drives new innovation and retention of both genders," it says. WISC lists changes to heavy vehicle rest stops as one strategy to encourage women to get behind the wheel of a truck. "Women sleeping alone at various rest stops could be requiring upgrades to rest stops, the need to address flexible workplace options and offering training in personnel safety and security should open up recruiting options," the report says. The NTC, which hosted an event to launch the report, says women play a large role in the organisation’s direction and success. "Women represent half of our executive and one third of our commissioners, including Nola," acting NTC CEO Michelle Hendy says.